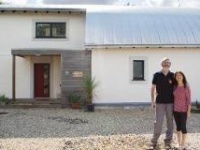 One young Irish family has taken the decision to build their new home in Co Louth to the passive house standard. In the first of a series of columns, Nessa Duggan explains the thinking behind the decision to go passive. I grew up in a large, draughty, listed building and I am never going back to that scenario. Cornicing, parquet floors and original fireplaces are all well and good but they don’t pay the heating bills. So one lovely husband and three adorable kids later my current home is just the opposite: really easy and inexpensive to heat, just the way I like it. If only it were big enough to accommodate our boisterous brood we would probably never leave. We bought our current home during the boom, not really thinking it would be where we would raise our family. Three sons later, we needed more space and a bigger garden, but were determined not to settle for a house that didn’t tick all the boxes. With a personal interest in the environment and energy efficiency, we made some improvements, closed in the open fire and installed a stove, added extra insulation and upgraded the heating controls. We enjoyed a decent size south-facing kitchen-diner and our little garden was a sun trap. All these added up to a very cosy home and a standard of comfort we were not willing to forsake for more space or a bigger garden. For over two years we viewed every potentially suitable house on the market. None ticked all the boxes and without exception, none would have been as comfortable as our home without a major renovation that would blow our budget. With draughty windows and boilers from the 1970s, we couldn’t be tempted to move. We always wanted to build our own home, with romantic notions of mature fruit trees and a vegetable patch, but didn’t think it was realistic in the area where we settled. Then, a site came on the market that could potentially tick all the boxes. It was close to the school, south-facing back garden, mature fruit trees, and gave us the opportunity to design a house for our specific needs and a high level of energy efficiency – it was too good to be true. We put an offer on the site that was accepted and paid a deposit within days, with only a vague notion of what to do next. The sale dragged out, as they do, and we set about researching the next steps. We were aware of the significant improvements in Part L of the building regulations (dealing with conservation of fuel and energy for dwellings) and spoke to friends, and friends of friends or anyone willing to chat about their self-build experiences. Luckily for us, we found lots of people more than happy to share their experiences. Many were passionate about the various technologies installed in their homes. Without exception, it seems the changes to Part L had a dramatic impact on the cost of heating new homes. Stories of not turning on heating systems for 11 months of the year are undoubtedly welcome and directly attributable to the new Part L changes. But more than once, instances of overheating in some houses made them uncomfortable and measures had to be taken to counteract the excess heat. 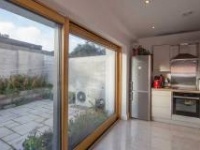 Stifling heat from solar gain causing windows to be left open all the time – who would have thought this would happen in Ireland? 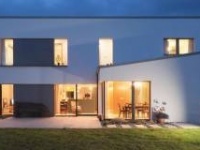 Some years previously, we visited the Scandinavian Homes passive house in Moycullen, Co. Galway. What struck me that day stayed with me, it is hard to put a finger on, but there was a feeling of freshness in the air and a peaceful silence. More recently, we visited a local new build, during the NZEB Open Doors weekend, and once again were struck by a serene feeling. The comfort of the even, ambient temperature and the silence of an airtight house close to a busy motorway is hard to describe. 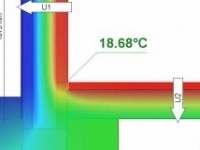 This brought us to research the passive house standard for our project. The idea of a cosy ambient temperature 24/7 sounded like a little piece of paradise. Of the several passive home owners we spoke to, the only regret that cropped up was not having factored a second fridge into the kitchen design – because all perishable food has a much shorter shelf life when the temperature in every corner of the house doesn’t stray far from 20C, 24/7. What we heard over and again was that careful planning and integration of passive design principles into the design from the outset was key to success. ‘Nearly passive’ to us meant a risk of overheating. As a techie couple, the idea of engineering an equilibrium into the design and operation of the house to create this ambient atmosphere clicked very quickly. The more we read, the more convinced we were, that we should attempt to achieve passive certification for our new build.